It is with great sadness that I read this evening that 29 year-old Erin Lahr of Austin collapsed and died at today's Dallas White Rock marathon. Though we have a great diversity of philosophies in the Austin running community, there is one thing of which I have absolutely no doubt, and that is our shared sorrow of this tragic news from Dallas. My condolences go out to her family in this difficult time. Now is the time to get out and vote! Competitor magazine is holding their annual "Best Of" reader's survey. Show your support for Smart Sport and Allan by voting today! 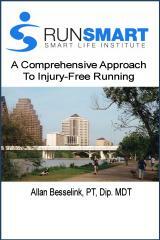 Vote in "Sports Injury Clinic or Doctor" and/or "Running Club" (RunSmart). The results will be announced in the January issue, available on newstands around Austin. Leeds County Books in Brockville, Ontario will be hosting a RunSmart book signing on Friday September 26 from 1:00 pm to 3:00 pm. Bring your copy - or purchase one there. Come join Allan Besselink and host Leeds County Books for this special event. The address for Leeds County Books is 73 King Street West, Brockville and their phone number is 613-342-5728. It's been an action-packed past couple of weeks for Team SSI. At the Austin Triathlon Olympic distance event, Noel Adorno placed first in her age group with a 2:41:04. At the Prairie Man half Ironman event, Greg Hogan claimed fourth in his age group with a 5:15:00. Congratulations to both for their great performances! The season's not over yet though - with many racing here in Austin at the Longhorn 70.3 half Ironman on October 5. Good luck to Greg Hogan, Katherine Malm, Christine Jones, Hugh Ayles, Robin Warnken, and Teresa Carney. Race Smart! SSI congratulates Dorian and Freddy Ramirez and welcomes them to the Ironman family. The couple took part in Ironman Louisville on 8/31/08. SSI athlete Noel Adorno has been interviewed by Matthew Dale of Ironman.com as she prepares for her first Ironman. Check out the full article here. Good luck on the Big Island, Noel!